Na een aantal jaren van afwezigheid weer op La Mariette geweest. Het was als vanouds vertrouwd gastvrij en erg prettig. Jan blijft of het nu naseizoen is de perfecte gastheer waarbij je je helemaal thuisvoelt. lekker je eigen gang gaan is zijn devies. Dat doet hij zelf ook. Er zijn weinig regels en in de gemeenschappelijke ruimtes zijn er spontane leuke contacten met andere gasten. En al was het naseizoen de omgeving werd er nog mooier op. Blijvende aanrader om telkens weer eens terug te komen. We can thoroughly recommend La Mariette. Having stayed 2 nights, we adjusted out holiday plans and returned for a further 4 nights. Jan, the host is relaxed and welcoming and the setting and area are wonderful. A lovely, idyllic place to stay in the heart of the Aude region. Jan is a perfect host and the location is excellent for visiting the area, lovely picturesque villages and small towns filled with traditional French charm. Well worth a visit to enjoy the beautiful French countryside. Steve – I was doing a car tour of France from the west to east coast and La Mariette seemed like a perfect place to stop and enjoy this particularly beautiful region. I wasn’t disappointed. The farm house is absolutely charming with very well designed modern interior by the owner Jan. A place to truly relax, no noise at all and a sky full of stars. A beautiful pool and hot tub area that makes you want to stay all day and not get in your car. But the best part of this place is Jan who adds even further to the no stress environment …. kind, well travelled and educated. I will definitely stay longer next time! Don’t hesitate to reserve. Frank – Wat een heerlijke plek ! Geweldige gastheer, ontspannen sfeer, prima kamer, heerlijk ontbijt, lekker zwemmen, prachtig uitzicht…. wat wil een mens nog meer…. Rénald et Jean-Michel – Belle étape (trop courte) dans un lieu superbe en pleine nature. L’accueil de Jan est chaleureux et on se sent vite “comme chez soit” dans cette chambre d’hôtes parfaitement bien restaurée et très confortable. Merci Jan et à une prochaine visite. Alain – La mariette est un endroit vraiment paisible; j’ai passé 3 jours vraiment reposant. Jan est très sympa et n’hésite pas renseigner sur les bons endroits autour de la chambre d’hôte. La maison est vraiment belle, les chambres sont confortables et le coin autour de la piscine est vraiment sympa! Je recommande c’est endroit pour un vrai séjour de repos! merci encore Jan pour ton accueil! cappa – Simply a place where a vacation turns in to nice and fun time! Laying down in the hotpot looking at a sky of stars hidden by hoak leaves was a great experience. If you want, hotpot can be just as HOT as you like. Jan is person with whom you may talk of politcs, life and cooking and he makes you feel better than at home. David – I have recently stayed at this guest house for 4 nights. It was absolutely perfect and the venue is ideal for anybody wanting to escape for some rest and relaxation in a quiet, calm tranquil setting. The garden area is spacious with plenty of sun loungers, little tables and reclining chairs around the pool area, and two terraces where you can sit and enjoy a drink and admire the spectacular views. There is also an out door hot tub with room for quite a few people which is a great treat by day or night. The rooms are well equipped and comfortable with great views and plenty of light. There is a separate toilet and shower on each floor so facilities are only shared with one other room. Breakfast was provided each day with a choice of fresh produce, cereals and speciality teas and coffees. The location is remote which is the idea, but there nearest town is about 20 mins away so make sure you bring enough supplies if you don’t want to venture out too often. Jan has his own “cave” and Jan sells wine at very reasonable prices, I would certainly recommend the Rose! Jan is a great host and makes everyone feel very welcome, I would recommend this guest house to anybody seeking a quiet relaxing break. Marc – We hebben 7 nachten gelogeerd in ‘la Mariette’ en hebben er een heerlijke tijd gehad. Het huis is prachtig gelegen en de kamers zijn schoon en comfortabel. We hebben genoten van het zwembad en de jacuzzi en uitstapjes gemaakt naar o.a. Toulouse en Lourdes. Jan Wals is een uitstekende gastheer. Nous avons passé 7 nuits en la Mariette. La maison est situee tres beau dans le paysage. La chambre etait tres propre. Le petit dejeuner etait tres bien soigné. Surtout la piscine nous plesait beaucoup. Jan est un hote tres agreeable. Nous pouvons recommander la Mariette a chaqun. Nicolas – Jan a su faire de la Mariette un véritable havre de paix. Son accueil est chaleureux et on se sent immédiatement « comme à la maison ». La décoration des chambres et des espaces communs est recherchée et simple à la fois dans le plus pure style nordique. La Mariette est le lieu parfait pour se ressourcer et profiter de la région. André – Toulouse is een hele prettige en mooie stad. En wat nu zo fijn is dat er vlakbij een fantastisch vakantieadres is! Dus combineer een bezoek aan (de omgeving van) Toulouse met een verblijf in La Mariette. Het is er prachtig en de ideale plek om echt te kunnen ontspannen. Joël – Un accueil sympa. Un lieu idéal pour se reposer, lecture et musique pour se ressourcer au soleil. . Pas eu le temps de visiter les alentours. Francisco – Maravillosa casa donde he pasado unos días de descanso y desconecté de la ciudad. Habitaciones muy confortables con cama de 1,80 m. Desayuno estupendo que me permitió coger fuerzas, incluso pude hacerlo en alguna de las terrazas que tiene la casa. Piscina y jacuzzi naturista para olvidarme de la ropa y disfrutar del sol. Toulouse solo estaba a 50 minutos en coche, y también pude disfrutar de los pequeños pueblos y sus mercados. Jan, el anfitrión me brindó una calurosa y cálida bienvenida, estando disponible para darme información sobre la zona. Genial convivencia con los otros huéspedes. Altamente recomendable. ton en frank – It is rare but sometimes it happens to you while traveling: you drive through the entrance of an unknown destination and you’re first reaction is “Bingo…this looks great……!” This pleasant surprise happened to us when we pulled into the grounds of La Mariette. An impressive house, originally a farmers building but carefully restored with its classical details still intact. A beautiful garden that combines the raw regional vegetation of the Midi Pyrenees with colorful flower-areas. A breathtaking view over miles of gentle hilly slopes and ofcourse a spacious pool. Thankfully the perfect impression of the outside doesn’t get underminded by a disappointing inside. 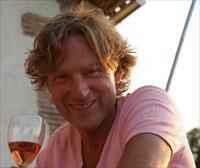 Everywere around you notice the professional designers-background of the owner Jan Wals. He combined modern design, smart and comfortable solutions and the use of contamporary materials with the original features of the old building. The rooms are spacious and comfortable and offer you a view over corn-hills and sunflower-fields. Besides, the beds are equipped with first class mattresses that are even long enough for larger north-European people. Jan Wals proves to be a perfect host who is very aware of the precarious balance between interpersonal connection and distance, so we felt both free and at home in his house and garden. The wide area surrounding the small hamlet of Ambax in which La Mariette is located is interesting to spend your holidays. The region of ‘Midi Pyrenees’ offers a large variety on possible day-trip destinations. So it would be a shame to be here without a car. You’ll also need that to reach the various restaurants in the neighbourhood. We’ve spent two wonderful weeks in the beautiful property of Jan Wals. “La Mariette”: an absolute must!!!! Harry et Jan – Un très bel endroit, dans un environnement rurale. Le hôte est très gentil et le petit déjeuner est merveilleux. Un bon choix pour s’y récupérer, aussi bien pour le weekend que pour une semaine de vacances. Nous avons joui de très bonnes vacances ici. Yannick et Hervé – La Mariette est calme, douce, jolie. Jan, le propriétaire, est très sympathique, accueillant. C’est une très bonne adresse !!! Mariette is quiet, soft, attractive. Jan, the owner, is very nice, welcoming. It is one very good address !!! Joost – Een prachtige huis in een schitterende omgeving. Toscane in Frankrijk! Gastheer Jan is zeer attent en geeft je een welkom gevoel zonder opdringerig te zijn. Wees vooral jezelf is zijn devies. Het was lastig kiezen tussen de vele terrassen waar je kan gaan zitten. Vele keuzes voor de vele momenten van de dag. En de plons in het zwembad met aansluitend een jacuzzi maakt het helemaal af. Robbert & Andre – Waar vind je nu een ideaal vakantieadres? Wij hebben het onlangs mogen ervaren: Een goede gastheer, een prachtig huis, een fijne slaapkamer met prima bedden, een heerlijke tuin met zwembad en een mooie omgeving. Kortom stop maar met zoeken, La Mariette gay guesthouse is top. Kijk ook maar op de site, de foto’s zeggen genoeg! Otto – La Mariette est une place superbe pour de détendre. La piscine est bon et le patron serve le petit déjeuner frais et aimable. Bas – I visited ‘La Mariette’ to work on my theatre play. It was the best place I could choose: quiet, friendly and a adorable host who made me feel at home. In the quietness of the sunflower fields I was able to do my job and of course there was also enough time to relax at the swimming pool and to enjoy the nice villages and their restaurants in the surrounding. Conclusion: a great place to work ánd enjoy your holiday. Christoph – Very nice place to stay on the countryside. The house was beautifully renovated by the owner and you have a great view on the surroundings. Jan, the owner, a perfect and charming host, let’s you feel coming home. Thank you, Jan! Joost – 4 nights in the most beautiful surrounings & great hospitality! A beautiful place to stay with a great host! Joost – Great hospitality in beautiful surroundings. A place to go back to! Like being a home but then better! Stéphane et Stéphane – Nous avons passé un excellent séjour dans un cadre reposant. Nous tenons tout particulièrement à remercier Jan pour son accueil chaleureux ainsi que sa gentillesse. C’est avec grand plaisir que nous reviendrons. Nous recommandons “La Mariette”. joost – Staying at La Mariette is like coming home… Beautiful surroundings & great hospitality! A place to return to!